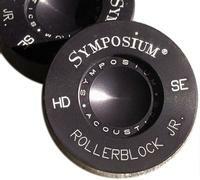 Symposium Acoustics - Rollerblock Jr.
BEWARE OF COUNTERFEIT ROLLERBLOCKS! Click Here to read more. Rollerblock Jr. consists of of 8 tops and bottoms and 4 center bearings, to make 4 "Double Stacked" isolator/coupler units. Each top and bottom is constructed of black anodized, aircraft alloy aluminum, and has a 1.875" diameter (4.76 cm) and 5/8" (1.58 cm) thickness. These dimensions were carefully chosen to make Rollerblock Jr. easy to use and set up, yet strong enough to withstand the rigors of use under heavier equipment such as large amplifiers and heavy loudspeakers. The special cup interior has been designed so that the top and bottom "sandwich" is stable with the ball inserted in the center, making for easy setup. The bottom and top are flat and suitable for all equipment chassis, as well as flat surfaces and carpeting. 7075 aluminum is harder than some steels and provides superior Brinnelling capacity (resistance to denting and deformation under extremely severe conditions) and superior mechanical coupling over 6061 aluminum. Hard Coat anodizing provides a thin, precision skin of ceramic hardness which constrained-layer damps the HDSE body, as in Rollerblock Series 2, and also retards wear in the cup area. Tungsten Carbide is the best material for use in ball bearing isolation devices; Grade 10 means that each ball meets or exceeds a sphericity and diameter tolerance of 10 parts per million, which is 2.5 times better than the best "off the shelf" ball bearings available. These are the same super-precision balls that are supplied with Series 2+ Rollerblocks, and are only bettered by the Grade 3 Superball (see below). HDSE was originally developed for use with heavy loudspeakers (HDSE was first introduced in the Symposium Panorama loudspeaker), but offers higher resolution and enhanced bass performance over standard Jr. versions in non-loudspeaker applications such as digital players, analog turntables, preamps, amps, power supplies and conditioners, etc. It is second in performance only to Series 2+ Rollerblocks. HDSE may also be ordered with State of the Art Grade 3 Superballs for maximum resolution.